The singer tweeted what you see above yesterday morning and quite a number of people and blogs assumed she was coming out of the closet as a lesbian. Not so says the Beri Beri singer.. Some blogs are Saying I am Gay, its totally not true. I tweeted that I was Gay which was my state of Mind not my Sexuality. I have been very sick and down for the past 3 weeks and I recently felt better and anyone following me on twitter must have noticed I didn't tweet for a while. My new video Super Girl was picked up to premier on a few Major American TV stations so I was very Gay. That was the only word to express how I really felt at that moment. I have nothing against lesbians, and homosexuals. In fact I have a lot of friends who are and I love them just the way they are. I am not a Lesbian or Bi sexual. My tweet was innocent. Gay in my dictionary means happy. ROTFLMAO! Using "Gay" to describe being happy is hardly recognized these days. Aren't there thousands of synonyms? WHO NONO SAY NOOLYWOOD AND NIGERIA MUSIC INDUSTRY IS FILLED WITH GAYS AND LESBIANS NA ONLI ODE WEY NO GO NO..
Stupid geh....who cares if she's gay or joyous?panti ewa! Given what I have read about this dencia, I suspect that she deliberately used the word "gay" instead of more obvious synonyms because she knew it would get her attention. Dencia, you can go ahead and feel Gay cos nobody cares about your sexuality...there are more better ways to make yourself popular young girl.For more information Go ask Charley Man. She used it to get attention joor. Haba there are thousands of non-controversial words to use. for the UMTEENPTH time people it's "I'm" and NOT "Am". Terrible how people say "Am ok" when it should be "I'm ok". useless! -A capital letter must come after a full stop. ("Useless!" not "useless!" Teacher nonsense! You don't know I'm is a contraction of I am abi? Rubbish. It's spelt "Umptenth" not "Umteenpth." And Tinuke,ur name is a noun so the first letter should be a capital letter. "Tinuke" not "tinuke." @Anon 12:31am....hahaaaaa, exactly, u make sense die. @Tinuke.....it's not like the girl was writing an essay, so abeg siddon! Chai Tinuke, anonymous 12:31 am don finish u. Talk of kettle calling pot black...kwikwikwikwi. I laff in Greek. plz ask her for me o! Madame banky! Anyway, 2our celebrity above! Mayb u shud watch what u say on social networks, cus as a celeb,ur words can b easily misconstrued.. I Feel So Gay! Just Like the phrase.gay means so many things and i dont fathom why so many people dont like hearing that word even when popularly exagerated. Gossipers go wet your pants and leave her alone. Bhahahahahahahahahha pls tell d Harvard breed. @anon 12:31, you didn't complete it for Tinuke. She actually wrote UMTEENPTH. I think she meant to spell umpteenth. Funny! Aunt tinuke , pls it is umpteenth bikonu.....you are welcome. @Tinuke: its spelt UMPTEENTH time! Mumu Fish! Correct urself first. Next time u use the word, state it with a small g! Seems like u got what u wanted, attention!! Addendum for Tinuke: Umpteenth and not Umpteenpth. Alright carry on. @Tinuke, English teacher,it is spelt 'UMPTEENTH' not UMTEENPTH. Olodo!! Its not about "onye cambridge" or whatever, it equally disgusts me when people say "am" instead of I"m. Its plain and simple english. Dencia is just seeking attention, publicity stunt. My dear u don't need all that if u are good @what u do. Anonymous 12:31.....hahhhaahaaaaa.thanks for putting Tinuke in her place biko.which one is the grammar class on a freaking blog.like serzly.she should get over herself already. Who cares, this girl is just an attention seeker. Dear Dencia in Nigeria we dnt no gay as been happy so next time use a language we understand.hehehehehe.lol @ Anon 12:31. Nne thank you for replying the biatch!!! The word is "umpteenth".... Thank you....and don't mention. Maybe na u Fela sing "teacher teacher for"
Yeah useful tinuke,I c ur 'umteenpth". Pot! Typical ...... Honestly,... she's not gay and can't be a lesbian. A man sleeping with a woman is not a lesbian. She is not bisexual. She was born a man. She's a Tanzanian, ...... No. I mean to say she's a transvestite ..... metrosexual .... biracial .... oh,... whatever ..... Amateur ..... she purposefully wanted herself in the media by creating a childish controversy. Tragic. lol @Anon 12:31. nice come back. i'm wondering why she's forming English teacher on a blog that's not hers. Linda wey get blog neva complain,na she!!!. mscheeeeeew. Only on Linda Ikeji's blog. The "use of English." I have learnt today. I'm impressed. lol. Oops, that should be Lol.. Capital letter after full stop. Instead of people to simply admit that their thesaurus is grossly lacking, they just go on to berate this girl. She actually used the word #stoked in the same tweet, maybe people thought it to me stocked. I saw the tweet and knew it was purely for attention, but I ignored it. When people start to make noise about it then you're giving her the attention she wanted in the 1st place. I congratulate her on her success though, if really her single is to be aired in the US. She too is making strides in the industry, no pun intended! anon 12:31am...ewu can beer! I bet u are one of those that say "ur" in plce of "u're". Nama! and to the one that said onye cambridge, kitikpa racha kwa gi ike there! LMAO.. Omo u wicked oh!!! @Anonymous 12:31,You should understand that ''Nobody is perfect'', and so you have to let tinuke be...you 've just made your own blunder when you wrote ''You want to show us you understand English ba''....what does ''ba''? mean in English language..(It should be '' right'' and not ''ba'' like you wrote.......and you also wrote that ''A capital letter (must) come after full stop'' instead of ''A capital letter (should) come after a full stop''..so you see that you are not also correct and so you are not qualified to correct someone else. Hehehehe oyinbo pepper ''UMTEENPTH''. Abeg park well joor! so she is not free again to use whatever she wants to use? why the insults? what is peppering you guys? 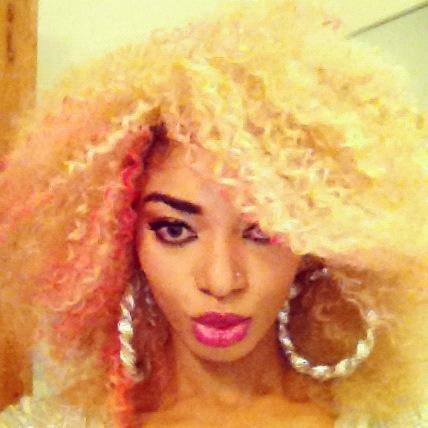 this is just simply hating, why are u lots hating on dencia? why? it will be your turn tomorrow just continue. God is watching you all..... and i use to be a big fan of linda but i am no more, i even use to defend linda but i see that she is wicked if u like madam linda dont post this only God will judge u, so u havnt read susan peters tweet? why do u want to bring her down? i really feel bad, we should encourage each other as women not to bring them down.so not fair. Ermm tinuke,what is umteenpth? I believe d word u were looking for is "umpteenth"!!! Madam english teacher,pls don't teach us nonsense! Linda baby post comment biko! thanks! tinuke you can't even spell and you are calling people out? My dear,it 'nkita'.. I evn tot U̶̲̥̅̊ r yoruba.. Abi na Ɣø̲̣̣UЯ igbo frnd giv U̶̲̥̅̊ d spelling??? Nigerians are the best:)East or West,I remain Naija for life. Lindoooooo,dey hail your commenters,I swear some of their comments are so cracking hilaristicious!! Abeg make person no attack my English o,na midnight schl I go with chalk and slate. Linda u refused to post my come back abi? Goat! Impressive. I see absolutely nothing wrong with tinuke's comment, same goes for the ensuing corrections. Sometimes I see comments here that have been written in such bad english, it'll give u a headache just trying to decipher. We really need to improve on our writing, several graduates cannot speak a line of english correctly, let alone white a simple comment. I've fallen victim to this sms short text when sending an official memo, my boss reprimanded me and for every thing I type or write, I try very hard to write in full. Some of us are here everyday, many of us send comments, its so easy to get carried away and type the same rubbish we do when it relates to serious writing. If we can correct one another I think we'll be getting more than just entertainment here.